While game development requires good programming skills, not all developers are experts at it. It's mostly because developing good games needs more than technical or coding know-how. It also involves good math and logic skills, and requires more complex thinking than what's usually applied on traditional applications. The game involves a ball and two paddles. The players can move the paddles up and down and the aim is to hit the ball with the paddle, and once the ball gets past the paddles, the game ends. The left player can move the paddle up and down using the W and S keys on the keyboard, while the other player uses the arrow keys (up and down) to move the paddle on the right hand. When developing a game, there are three important things that need to be considered during the coding phase. First, the structure for the source code should be modularized. In general, the source code of a game is longer and more complex compared to other applications. Next, we should be attentive to all the ratios and constants used in the game, and these should be separated so they can be easily modified. Finally, each game has a so called "main loop" that draws the game environment, defines the game rules, sets up the events, and applies logic for moving objects around. The main loop has to be written in a way that is easily understandable and well structured. 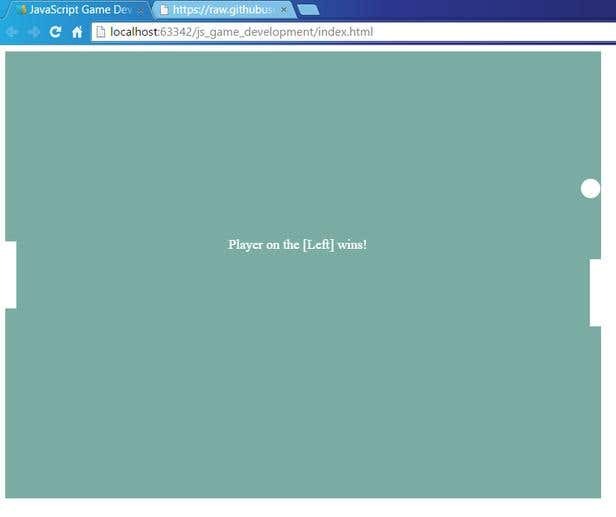 The game field is a standard HTML canvas that sets its background color. We have this defined in the index.html file. The style.css is very simple and it only sets the background of the canvas. In the constants.js file we have all the constants which are used in the game. There are two paddles in the game, one for each player, located at opposing ends of the game field. 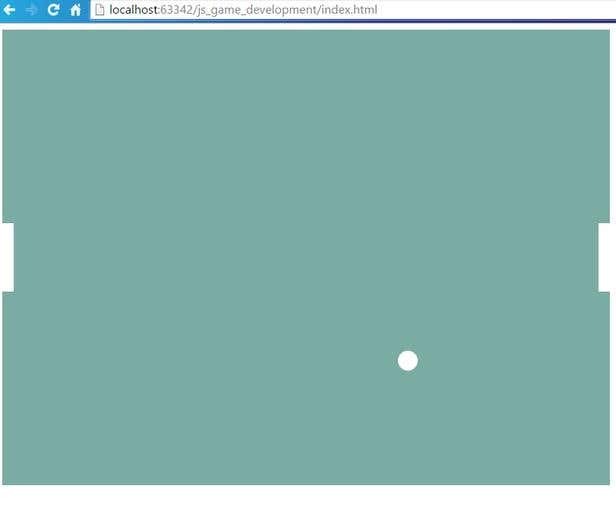 The paddles are defined in the createGameEnvironment.js file. After setting up the game canvas (accessing the context and clearing it with the clearRect method) the paddles are drawn using the rect method of the context. The color of the paddle can be set using the fillStyle and fill methods. In the addRightPaddle method, we have key handling events too. We have the rightUp and rightDown flags, which signify which buttons were pressed on the keyboard. If the up key was pressed (to move the paddle up) we change the paddle’s Y position with the PADDLE_STEP constant. If the down key was pressed (to move the paddle down) then we increase the Y position of the paddle with the PADDLE_STEP constant. Besides the paddles, the ball is also a moving part in the game. The ball is drawn using the arc method of the 2d canvas context. The method needs an X, Y positions and a radius, plus the starting angle of the arc (specified in radians) and the ending angle (also in radians). First, we clear the context, meaning that we wipe out all the items on the canvas, add the left and right paddles, then draw the ball. Then comes the math part to detect if the ball has passed the left or the right paddles to determine which player won. The x and y are the coordinates of the ball while the dx and dy values are the values that change to simulate the ball’s movement. For the right wall we have to check if the current X position of the ball plus the movement step is larger than the width of the canvas minus the width of the paddle. Then we check the Y coordinate—if the Y position of the ball is within the values of the paddle's top and bottom Y coordinates, then we change the direction (dx = -dx) of the ball. If the Y values are not within the paddle coordinates, it means the player on the right did not catch the ball and the player on the left has won the game. The logic is the same for the left wall, but of course with changing the values of the specific coordinates for the left paddle. Here, the logic is straightforward; if the current position of the ball plus the change of the movement is larger than the canvas height minus the ball radius, then we switch the direction (dy = -dy). This article only covers a minor part of game development—how to implement motion and control—but a lot more needs to be done to complete this game. To create a fairly usable game from this idea, a developer would need to create sprites for the canvas and the ball, set a nice background image for the game environment, design pop-ups for displaying information, implementing a counter for the score, or asking for the names of the players before starting the game.